The pattern goes up to a 64" bust, but as written it isn't all that well designed to accommodate larger sizes - the shoulders and neckline end up too wide. Also the side panel width doesn't change (but I think that it should—a person who is bigger around also tends to have wider sides). 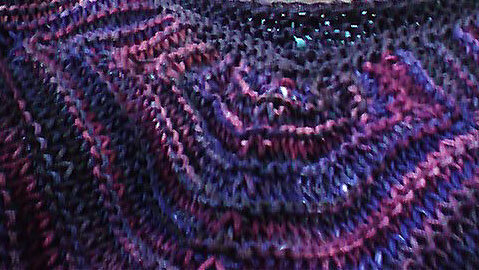 We did it as a KAL on the ample-knitters yahoo group. Different folks modified the pattern in different ways to address these issues. My bust is larger than the 44" size I knit; I made up the difference by increasing the width of the side panels. Also I modified the triangles at the bottom of the back sweater panel to accommodate wider hips. (I won't do that again if I make another Heartbeat Sweater, because it makes the bottom of the sweater into an upside-down vee shape, which isn't entirely flattering. But it looks OK for this one). I used #5 needles and continental knitting for the first front/back panel, but the fabric was too loose. I switched to #3 needles and combination knitting for the second front/back panel. When I was ready to start the sleeves, side panels, and neckline I discovered the purple yarn was much thinner than the multicolored yarn, so I knit with two strands held together on #2 needles. The sweater is loose on me - my gauge-fu for garments larger than socks or hats is weak (and it doesn't help when I change techniques and needle sizes mid-project). It has some drape so it looks OK at this size, but I may take in the side panels at some point. Better pictures to come. I've mislaid my camera so I took this on my crappy cellphone camera. It's a detail of the front panel and neckline. Pretty colours. Gauge can be such a pain, even the Yarn Harlot complains regularly about it. Thanks! Yeah, as long as I keep in mind that I'm likely to need to do "fit adjustments" in any large garment knitting project, and/or that I will do best with garments that can be tried on as I go, I don't get too frustrated about it. I love the colors! I hate it when people just size up everything to make larger sizes. I've measured out that necklines will fall off my shoulders. Fortunately, I can work from scratch or alter patterns. My grandmother taught me how to do that when I was eight and it has come in handy many times.